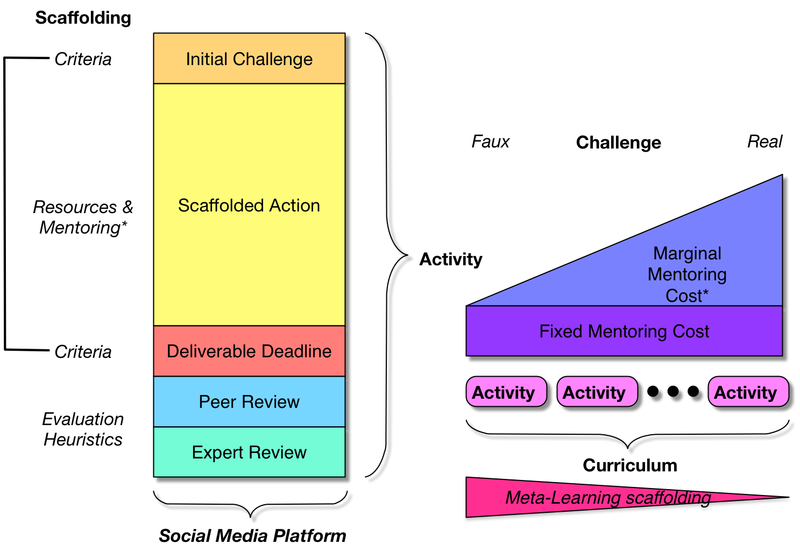 I’ve been working on a learning design that integrates developing social media skills with developing specific competencies, aligned with real work. It’s an interesting integration, and I drafted a pedagogy that I believe accomplishes the task. It draws heavily on the notion of activity-based learning. For your consideration. The learning process is broken up into a series of activities. Each activity starts with giving the learning teams a deliverable they have to create, with a deadline an appropriate distance out. There are criteria they have to meet, and the challenge is chosen such that it’s within their reach, but out of their grasp. That is, they’ll have to learn some things to accomplish it. As they work on the deliverable, they’re supported. They may have resources available to review, ideally curated (and, across the curricula, their responsibility for curating their own resources is developed as part of handing off the responsibility for learning to learn). There may be people available for questions, and they’re also being actively watched and coached (less as they go on). Now, ideally the goal would be a real deliverable that would achieve an impact on the organization. That, however, takes a fair bit of support to make it a worthwhile investment. Depending on the ability of the learners, you may start with challenges that are like but not necessarily real challenges, such as evaluating a case study or working on a simulation. The costs of mentoring go up as the consequences of the action, but so do the benefits, so it’s likely that the curriculum will similarly get closer to live tasks as it progresses. At the deadline, the deliverables are shared for peer review, presumably with other teams. In this instance, there is a deliberate intention to have more than one team, as part of the development of the social capabilities. Reviewing others’ work, initially with evaluation heuristics, is part of internalizing the monitoring criteria, on the path to becoming a self-monitoring and self-improving learner. Similarly, the freedom to share work for evaluation is a valuable move on the path to a learning culture. Expert review will follow, to finalize the learning outcomes. The intent is also that the conversations and collaborations be happening in a social media platform. This is part of helping the teams (and the organization) acquire social media competencies. Sharing, working together, accessing resources, etc. are being used in the platform just as they are used for work. At the end, at least, they are being used for work! This has emerged as a design that develops both specific work competencies and social competencies in an integrated way. Of course, the proof is when there’s a chance to run it, but in the spirit of working out loud…your thoughts welcome. Why should you, as a learning designer, take a game design workshop? What is the relationship between games and learning? I want to suggest that there are very important reasons why you should. Just so you don’t think I’m the only one saying it, in the decade since I wrote the book Engaging Learning: Designing e-Learning Simulation Games, there have been a large variety of books on the topic. Clark Aldrich has written three, at least count. James Paul Gee has pointed out how the semantic features of games match to the way our brains learn, as has David Williamson Shaeffer. People like Kurt Squire, Constance Steinkuhler, Henry Jenkins, and Sasha Barab have been strong advocates of games for learning. And of course Karl Kapp has a recent book on the topic. You could also argue that Raph Koster’s A Theory of Fun is another vote given that his premise is that fun is learning. So I’m not alone in this. But more specifically, why get steeped in it? And I want to give you three reasons: understanding engagement, understanding practice, and understanding design. Not to say you don’t know these, but I’ll suggest that there are depths which you’re not yet incorporating into your learning, and you could and should. After all, learning should be ‘hard fun’. The difference between a simulation and a game is pretty straightforward. A simulation is just a model of the world, and it can be in any legal state and be taken to any other. A self-motivated and effective self-learner can use that to discover what they need to know. But for specific learning purposes, we put that simulation into an initial state, and ask the learner to take it to a goal state, and we’ve chosen those so that they can’t do it until they understand the relationships we want them to understand. That’s what I call a scenario, and we typically wrap a story around it to motivate the goal. We can tune that into a game. Yes, we turn it into a game, but by tuning. And that’s the important point about engagement. We can’t call it game; only our players can tell us whether it’s a game or not. To achieve that goal, we have to understand what motivates our learners, what they care about, and figure out how to integrate that into the learning. It’s about not designing a learning event, but designing a learning experience. And, by studying how games achieve that, we can learn how to take our learning from mundane to meaningful. Whether or not we have the resources and desire to build actual games, we can learn valuable lesssons to apply to any of our learning design. It’s the emotional element most ID leaves behind. I also maintain that, next to mentored live practice, games are the best thing going (and individual mentoring doesn’t scale well, and live practice can be expensive both to develop but particularly when mistakes are made). Games build upon that by providing deep practice; embedding important decisions in a context that makes the experience as meaningful as when it really counts. We use game techniques to heighten and deep the experience, which makes it closer to live practice, reducing transfer distance. And we can provide repeated practice. Again, even if we’re not able to implement full game engines, there are many important lessons to take to designing other learning experiences: how to design better multiple choice questions, the value of branching scenarios, and more. Practical improvements that will increase engagement and increase outcomes. Finally, game designers use design processes that have a lot to offer to formal learning design. Their practices in terms of information collection (analysis), prototyping and refinement, and evaluation are advanced by the simple requirement that their output is such that people will actually pay for the experience. There are valuable elements that can be transferred to learning design even if you aren’t expecting to have an outcome so valuable you can charge for it. As professionals, it behooves us to look to other fields with implications that could influence and improve our outcomes. Interface design, graphic design, software engineering, and more are all relevant areas to explore. So is game design, and arguably the most relevant one we can. So, if you’re interested in tapping into this, I encourage you to consider the game design workshop I’ll be running for the ATD Atlanta chapter on the 3rd of June. Their price is fair even if you’re not a chapter member, and it’s great deal if you are. Further, it’s a tried and tested format that’s been well received since I first started offering it. The night before, I’ll be busting myths at the chapter meeting. I hope I’ll see you there! In the industrial age, you really didn’t need to understand why you were doing what you were doing, you were just supposed to do it. At the management level, you supervised behavior, but you didn’t really set strategy. It was only at the top level where you used the basic principles of business to run your organization. That was then, this is now. Things are moving faster, competitors are able to counter your advances in months, there’s more information, and this isn’t decreasing. You really need to be more agile to deal with uncertainty, and you need to continually innovate. And I want to suggest that this advantage comes from having a conceptual understanding, a model of what’s happening. There are responses we can train, specific ways of acting in context. These aren’t what are most valuable any more. Experts, with vast experience responding in different situations, abstract models that guide what they do, consciously or unconsciously (this latter is a problem, as it makes it harder to get at; experts can’t tell you 70% of what they actually do!). Most people, however, are in the novice to practitioner range, and they’re not necessarily ready to adapt to changes, unless we prepare them. What gives us the ability to react are having models that explain the underlying causal relations as we best understand them, and then support in applying those models in different contexts. If we have models, and see how those models guide performance in context A, then B, and then we practice applying it in context C and D (with model-based feedback), we gradually develop a more flexible ability to respond. It’s not subconscious, like experts, but we can figure it out. So, for instance, if we have the rationale behind a sales process, how it connects to the customer’s mental needs and the current status, we can adapt it to different customers. If we understand the mechanisms of medical contamination, we can adapt to new vectors. If we understand the structure of a cyber system, we can anticipate security threats. The point is that making inferences on models is a more powerful basis than trying to adapt a rote procedure without knowing the basis. It’s also a sound basis for innovation. Two related models (ahem) of creativity say that new ideas are either the combination of two different models or an evolution of an existing one. Our brains are pattern matchers, and the more we observe a pattern, the more likely it will remind us of something, a model. The more models we have to match, the more likely we are to find one that maps. Or one that activates another. Consequently, it’s also one of the things I push as a key improvement to learning design. In addition to meaningful practice, give the concept behind it, the why, in the form of a model. I encourage you to look for the models behind what you do, the models in what your presented, and the models in what your learners are asked to do. It’s a good basis for design, for problem-solving, and for learning. That, to me, is a big opportunity. If you’re anywhere near Austin, you should check out the upcoming eLearning Symposium May 7 and 8. I’m speaking on the L&D Revolution I’m trying to incite, and then offering a half day workshop to help you get your strategy going. There’s a nice slate of other speakers to help you dig deeper into elearning. I’ll also be speaking on Serious eLearning at Callidus Cloud Connections in Las Vegas May 11-13. If you’re into Litmos, or thinking about it, it’s the place to be. If you’re near Atlanta, I’ll be busting learning myths in an evening session for the ATD Chapter on the 2nd of June, and then running a learning game workshop on the 3rd. You’ll find out more about learning and engagement; you can and should add game elements to your learning design. I’m serious when I say that “learning can, and should, be hard fun“. And I’ll be touting the needed L&D Revolution up in Vancouver June 11, keynoting the CSTD Symposium. There’s a great line up of talks to raise your game. I would love to meet you at one of these events; hope to see you there (or there, or there, or there). Week before last, Will Thalheimer and I had another one of our ‘debates’, this time on the Kirkpatrick model (read the comments, too!). We followed up last week with a live debate. And in the course of it I said something that I want to reiterate and extend. The reason I like the Kirkpatrick model is it emphasizes one thing that I see the industry failing to do. Properly applied (see below), it starts with the measurable change you need to see in the organization, and you work backwards from there. You go back to the behavior change you need in the workplace to address that measure, and from there to the changes in training and/or resources to create that behavior change. The important point is starting with a business metric. No ‘we need a course on this’, but instead: “what business goal are we trying to impact”. The problems with Kirkpatrick are several. For one, even he admitted he numbered it wrong. The starting point is numbered ‘four’, which misleads people. So we get the phenomena that people do stage 1, sometimes stage 2, rarely do they get to stage 3, and stage 4 is almost non-existent, according to ATD research. And stage 1, as Will rightly points out, is essentially worthless, because the correlation between what learners think of the learning and the actual impact is essentially zero! Finally, too often Kirkpatrick is wrongly considered as only to evaluate training (even the language on the site, as the link above will show you, talks only about training). It should be about the impact of an intervention whatever the means (see above). And the impact is what the Kirkpatrick model properly is about, as I opined in the blog debate. So, in the live debate, I said I’d be happy for any other model that focused on working backwards. And was reminded that, well, I proposed just that a while ago! The blog post is the short version, but I also wrote this rather longer and more rigorous paper (PDF), and I’m inclined think it’s one of my more important contributions to design (to date ;). It’s a fairly thorough look at the design process and where we go wrong (owing to our cognitive architecture), and a proposal for an alternative approach based upon sound principles. I welcome your thoughts! In the Debunker Club, a couple of folks went off on the 70:20:10 model, and it prompted some thoughts. I thought I’d share them. If you’re not familiar with 70:20:10, it’s a framework for thinking about workplace learning that suggests we need to recognize that the opportunity is about much more than courses. If you ask people how they learned the things they know to do in the workplace, the responses suggest that somewhere around 10% came from formal learning, 20% from informal coaching and such, and about 70% from trial and error. Note the emphasis on the fact that these numbers aren’t exact, it’s just an indication (though considerable evidence suggests that the contribution of formal learning is somewhere between 5 and 20%, with evidence from a variety of sources). Now, some people complain that the numbers can’t be right, no one gets perfect 10 measurements. To be fair, they’ve been fighting against the perversion of Dale’s Cone, where someone added numbers on that were bogus but have permeated learning for decades and can’t seem to be exterminated. It’s like zombies! So I suspect they’re overly sensitive to whole numbers. And I like the model! I’ve used it to frame some of my work, using it as a framework to think about what else we can do to support performance. Coaching and mentoring, facilitating social interaction, providing challenge goals, supporting reflection, etc. And again to justify accelerated organizational outcomes. The retort I hear is that “it’s not about the numbers”, and I agree. It’s just a tool to help shake people out of the thought that a course is the only solution to all needs. And, outside the learning community, people get it. I have heard that, over presentations to hundreds of audiences of executives and managers, they all recognize that the contributions to their success came largely from sources other than courses. However, if it’s not about the numbers, maybe calling it the 70:20:10 model may be a problem. I really like Jane Hart’s diagram about Modern Workplace Learning as another way to look at it, though I really want to go beyond learning too. Performance support may achieve outcomes in ways that don’t require or deliver any learning, and that’s okay. There’re times when it’s better to have knowledge in the head than in the world. So, I like the 70:20:10 framework, but recognize that the label may be a barrier. I’m just looking for any tools I can use to help people start thinking ‘outside the course’. I welcome suggestions! Sorry for the lack of posts this week; Monday was shot while I migrated my old machine to a new one (yay)! Tuesday was shot with catching up. Wed was shot with lost internet, and trying to migrate the lad to my old machine. So today I realize I haven’t posted all week (though you got extra from me last week ;)! So here’s one reflection on the conference last week. First, if you haven’t seen it, you should check out the debate I had with the good Dr. Will Thalheimer over at his blog about the Kirkpatrick model. He’s upset with it as it’s not permeated by learning, and I argue that it’s role is impact, not learning design (see my diagram at the end). Great comments, too! We’ll be doing a hangout on it on Friday the 3rd of April. The other interesting thing that happened is on the first day I was cornered three times for deep conversations on measurement. This is a good thing, mostly, but one in particular was worth a review. The discussion for this last centered on whether measurement was needed for most initiatives, and I argued yes, but with a caveat. There was an implicit thought that for many things that measurement wasn’t needed. In particular, for informal learning when we’ve got folks successfully developed as effective self-learners and a good culture, we don’t need to measure. And I agree, though we might want to track (via something like the xAPI) to see what things are effective or not. However, I did still think that any formal interventions, whether courses, performance support, or even specific social initiatives should be measured. First, how are you going to tune it to get it right? Second, don’t you want to attach the outcome to the intervention? I mean, if you’re doing performance consulting, there should be a gap you’re trying to address or why are you bothering? If there is a gap, you have a natural metric. I am pleased to see the interest in measurement, and I hope we can start getting some conceptual clarity, some good case studies, and really help make our learning initiatives into strategic contributions to the organization. Right?